Large church builds around the world represent impressive architectural styles and many sacred materials. Followings are 10 largest churches in the world, based on floor area covered by the building. Standing at 161.5 m, high Ulm minster located in the Ulm city of Germany is the tallest church in the world. This church has an internal area of 8260 square meters. It is also one of the great examples of Gothic church architecture. There are 768 steps to reach the top of the church. 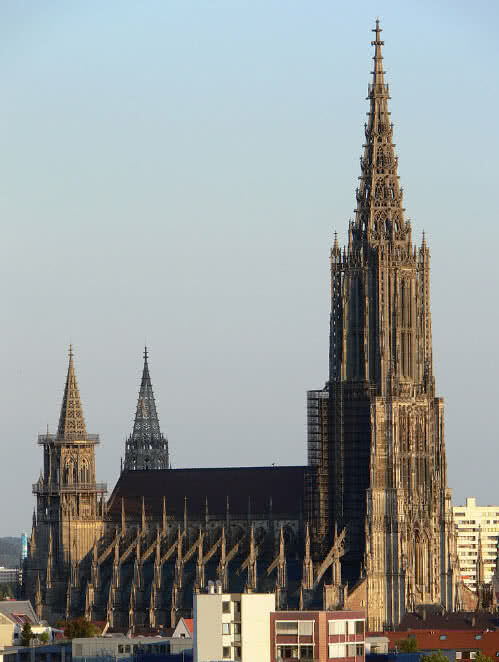 From the top level, the church offers a magnificent panoramic view of Ulm city. The construction of this church was started in 1377 and halted for a long time. It finally completed on 31st May 1890. Today, its is a protestant church, converted in the 16th century. The tall spires of the church symbolize the way to heaven. 15th-century choir stalls made of oak and carvings of hundreds of busts are the most notable attractions of Ulm minster. The stalls were sculpted by famous German sculptor Jirg Syrin the Elder. The main hall also crowned with a statue of a sparrow – The signature symbol of Ulm city. The El Pilar basilica in the Argon community of Spain is the first ever church dedicated to Virgin Mary. According to hypothetical believes, Virgin Mary appeared to Apostle Saint James while he was in prayer on the bank of Ebro river in Iberian Peninsula of Spain. Virgin Mary gave a statue of herself made of wood and a pillar. Then she instructed him to build a church. Following her instruction, Saint James built a small church in Zaragoza province in 1st century A.D. Some churches were added to the site in following centuries. The first chapel on the site also got distorted by that time. But the statue of Virgin Mary and the pillar remain intact. Today’s model of the El pilar basilica was built in the 17th century. A century after Spanish architect Ventura Rodriguez renovated it. The final works of pillars of the church completed in the 20th century. This large church has an internal area of 8318 square meters. There are four impressive towers and eleven cupolas in the church. The 15 inches tall statue of Virgin Mary located in the holy chapel of the church. 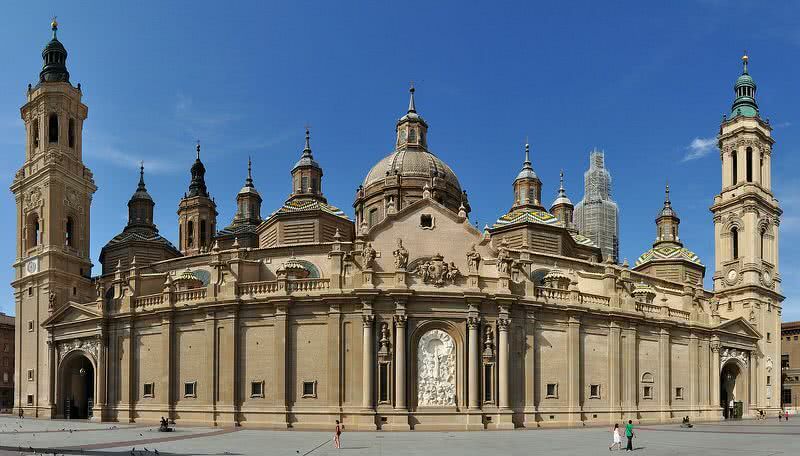 Today El Pilar cathedral is one of most visited pilgrimage centers in Spain. The church of the holy trinity is the largest church in Portugal. It is located in Santarem district of Portugal. This church has a modern oval design and the internal area of 8700 square meters. The large church can accommodate 9000 worshipers at a time. The church is dedicated to the Virgin Mary. It was built between 2004 and 2007 by Greek architect Alexandros Tombazis. This church also houses several chapels and 44 confessionaries. With an internal area of 9687 square kilometers, the Liverpool cathedral is the largest cathedral in the United Kingdom. Stretching over 189 meters in length Liverpool cathedral is also the longest cathedral in the world. It is a non-spired church that measures 101 meters in height. The large cathedral is also known as the Metropolitan cathedral of Christ the King. 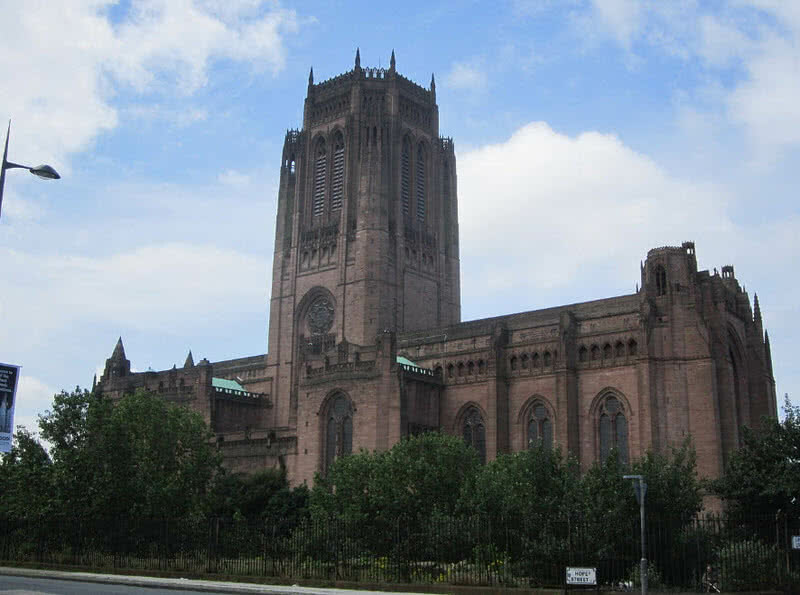 The construction of Liverpool cathedral started in 1904 and completed in different phases in the history. The Liverpool cathedral was finally consecrated in 1978. The main altar located in a circular design inside the church. The interior also decorated with many colors. With 10268 pipes Grand organ of Liverpool church is the largest operational church organ in the world. Another notable attraction of this cathedral is the 67-meter high peak, and it is the heaviest and highest peal in the world. With a ground area of 10090 square meters and height of 141.2 meters, Basilica of our lady of Lichen is one of the largest churches in the world. 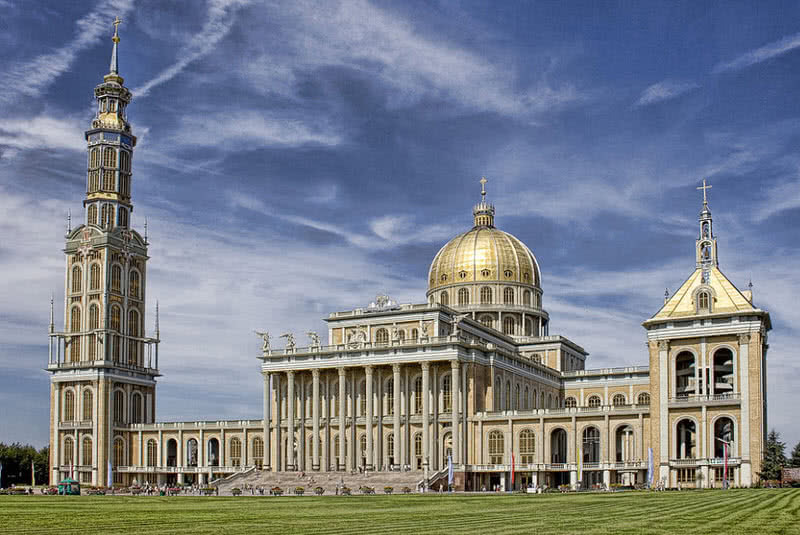 This magnificent church located in the Konin city of Poland. The construction of the church started in 1994 and took ten years to the completion. 33 steps are leading towards the church that represents the early life of Jesus Christ. This church also features 365 windows, 52 doors and 12 columns which symbolize the number of days and weeks in a year and 12 Apostles respectively. 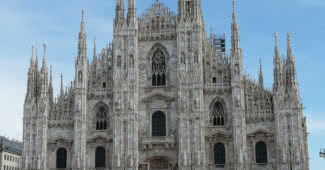 Milan Cathedral in Milan city of Italy is the second largest Catholic cathedral in the world. It is also one of the finest examples of Gothic architecture. There are 135 spires in the church. The spires are also crowned with statues that represent significant people in the history of Italy. The tallest spire of Milan cathedral stands at the height of 108.8 meters. The spire also mounted with a golden statue of Virgin Mary (Milan the Madonnia). 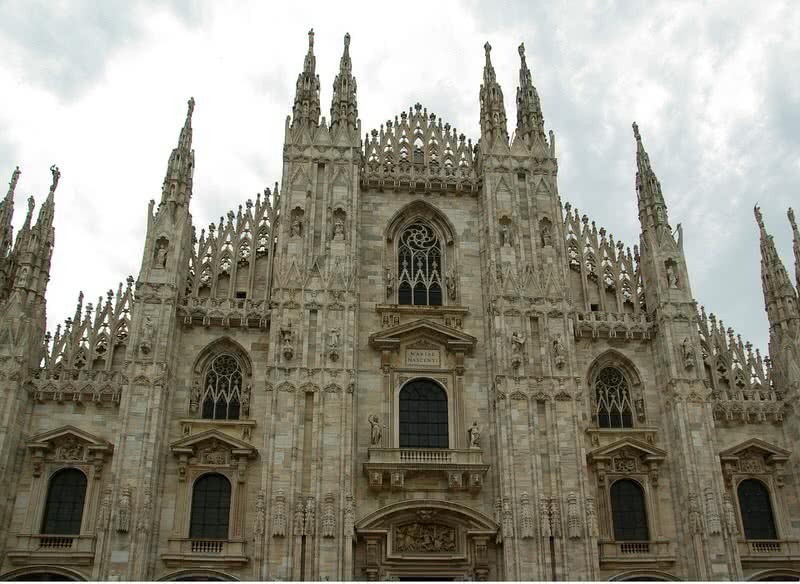 The construction of Milan cathedral started in 1386 and proceeded for next five centuries. The massive cathedral has a length of 157 meters and can accommodate 40000 worshipers at a time. The cathedral is decorated with 3400 magnificent statues. They represent different styles of sculpting. The visitors can climb up to the roof of the cathedral. The cathedral also has an exceptional collection of sculptures and paintings. 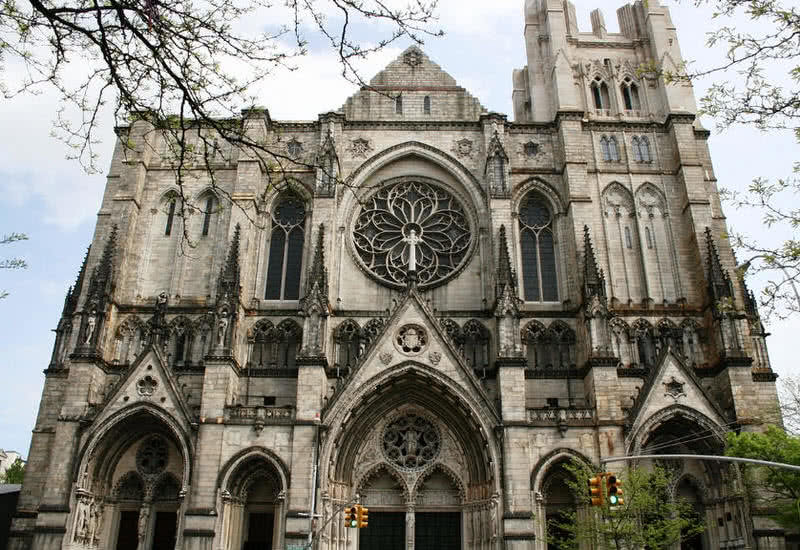 The cathedral of Saint John, The Divine in New York City, is the largest Anglican cathedral in the world. The enormous cathedral has an internal area of 112000 square meters and a length of 183.2 meters. The construction of the cathedral began in 1892. It was originally designed by two famous American architects, George Heins and Christopher Grant Lafarge. The construction of the choir and domed vault of the cathedral proceeded for more than 20 years. After the death of George Heins, new architects chose the Gothic design for the cathedral. The construction halted for many years during World War II. Some part of the cathedral also destroyed by fire in 2001 and restoration remained unfinished. The dome crossing of Saint John The divine has a height of 162 feet. The entrance of the cathedral depicts Saint John witnessing the Transfiguration of Jesus Christ. Some of the famous verses from the Bible were also engraved in stone at the entrance. The main door of Saint John The divine made of bronze and decorated with 48 relief panels. The cathedral also features a large rose window made of 10000 pieces of colored stained glass. It is the fifth largest stained-glass window in the world and largest in the United States. Seville cathedral in Seville city of Spain is the largest cathedral in the world. The cathedral has an internal area of 11520 square meters. It is also one of UNESCO world heritage sites in Spain and third largest church in the world. The cathedral is also the final resting place of great Genoese explorer Christopher Columbus. The cathedral was built to commemorate the power and wealth of the city. The cathedral was constructed between 1402 and 1528 on the site of Almohad mosque, to mark the power of the city after Reconquista of Iberia from Moors. The enormous cathedral was designed by the French architect Rouen Cathedral. The central nave of the Seville cathedral stands 42 meters in height. The vast interior has a grand decoration with gold. One of the major attraction of the cathedral is 45 wooden carved scenes from the life of Jesus Christ. It is the biggest altarpiece in the world. 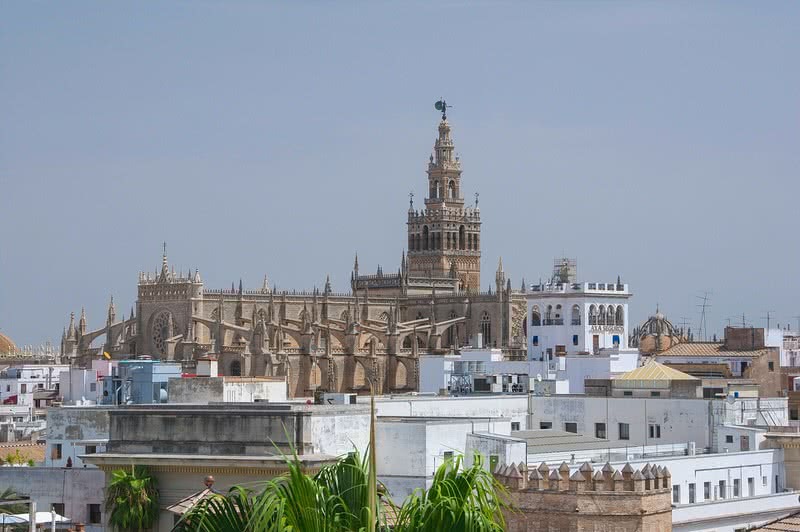 The Seville cathedral also has large chapels and choirs The La Giralda, the minaret of the Almohad mosque still stand beside the cathedral. 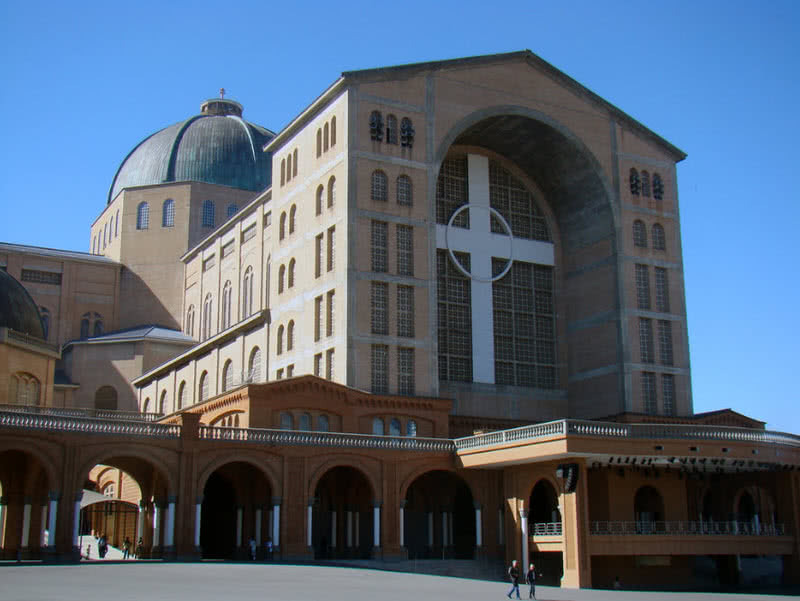 The Basilica of our lady of Aparecida is the second largest church in the world with a floor area of 12000 square meters. 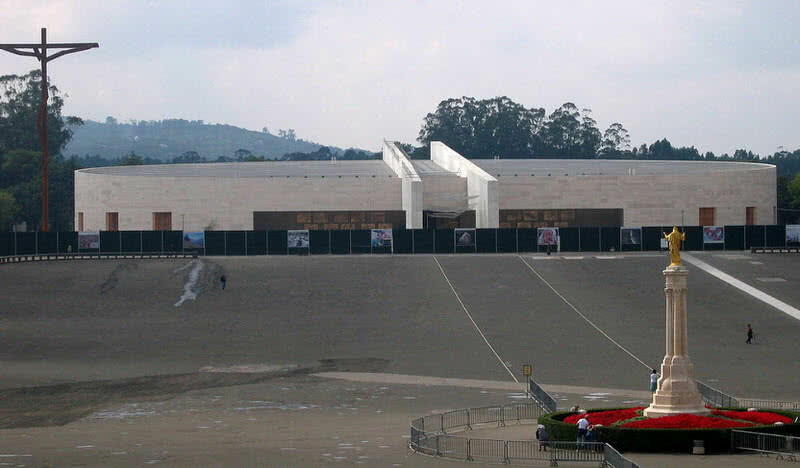 It is the most important Marian pilgrimage center in Brazil, located in the city of Aparecida. The large church can accommodate 45000 worshipers. According to mythology, a group of fishers got a headless statue of Virgin Mary from Paraiba river while fishing in 1717. They also haul up the head of the statue on another cast of the nets. They brought the sculpture of Virgin Mary to their home. They housed the sculpture in the shrine in 1945. It is believed to be the statue was sculptured by a Brazilian monk named Frei Agostino de Jesus. A new church on the spot of the old shrine was built between 1834 and 1888. Today’s version of the cathedral built in the 20th century. The towers of the church rise to 102 meters and its dome are 70 meters high. St.Peter’s Basilica in Vatican City is the largest cathedral in the world. It stretches over 186 meters in length and has an internal area of 15160 square meters. The magnificent central dome of the cathedral rises to 136 meters high. St.Peter’s basilica is the most important church in Roman Catholicism. The vast cathedral can accommodate 20000 prayers at a time. The original cathedral was built in 320 AD by Emperor Constantine. It was redesigned and enlarged in the 15th century by Pope Nicolas V. The 41 meters high dome of St.Peter’s cathedral was designed great Italian artist Michelangelo. The top level of colonnade contains 140 statues of various saints. The sculpting of the statues started in 1662 and processed for next 41 years. 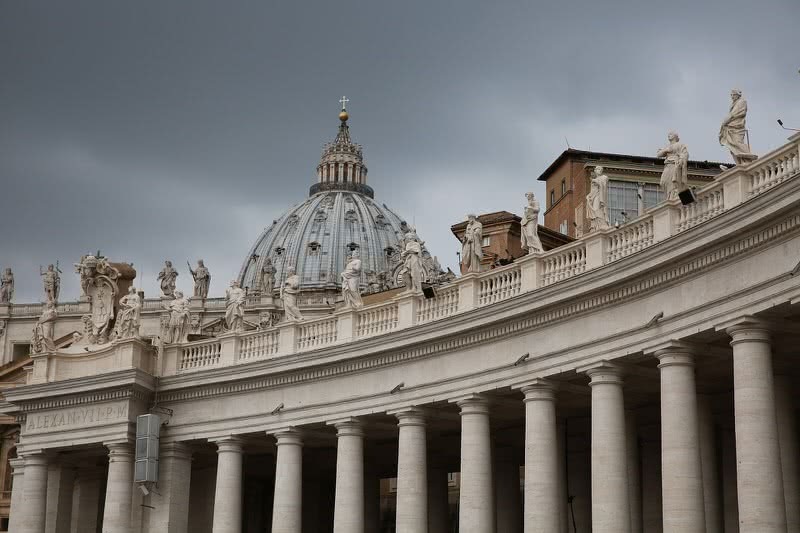 St.Peters’s Basilica houses 100 tombs including popes, Roman emperor Otto II and Swedish Queen Christina. There is also a holy door in the cathedral that only open during holy years.